I don’t know… we may also need him as a winger. It will be interesting to see what they do. He is not a tall boy either. I recon that’s why he was drafted. Not many small defenders go first pick. Well, he’s not a tall boy. Edit…bugger, beaten to the punch. i Don’t think we’ve seen his best yet and it may be through the middle. I actually see McGrath being used similarly to how we used Goddard…just with added run/legspeed but minus the weapon kicking. Goddard was a high possession utility used through the midfield (inside/outside) and down back to provide drive and direction out half back. Don’t quote me on it because my memory is a bit foggy, but when Goddard had that little knee scare early in the saints game I think it was McGrath who slotted into Goddard’s HB accumulater/ midfield role and what happened? McGrath had arguably his best game for us - 33 touches and 5 x R50’s (equal second). This is the utility role I see for McGrath over his 300 game career. Greg William was a beautiful kick as well. My knock on Andy McGrath is his handballs are usually backwards, no where as damaging as Williams or Jobes. Once he starts taking the game on his game will go to another level. If he’s playing his role, and we’re winning games of football… why does he have to be better than Garry Ablett? When he puts on some more size and strength that will come naturally. He will have far more time and space to use the footy. Little bit like Langford, the turning point for him was when he could stand up in a tackle. He looks to have time, where as before he was a little rushed. Mcg will be the one to take the biggest step fwd next year of anyone on the list. I don’t think we’ve even seen close to his best yet. I don’t think he’ll be as much use as a mid until he has the body to play on the inside. He’s kinda wasted out on a wing imo, as he does his best work at the contest, when the ball is hot. Gavin Wanganeen. Baby Bomber back pocket. Won a Charlie playing down back (and a flag). I wouldn’t mind playing Pidge back & giving Irish a run on the ball. Andy says he has come back stronger and faster. Now that is good news. Gives a good interview does Andy. 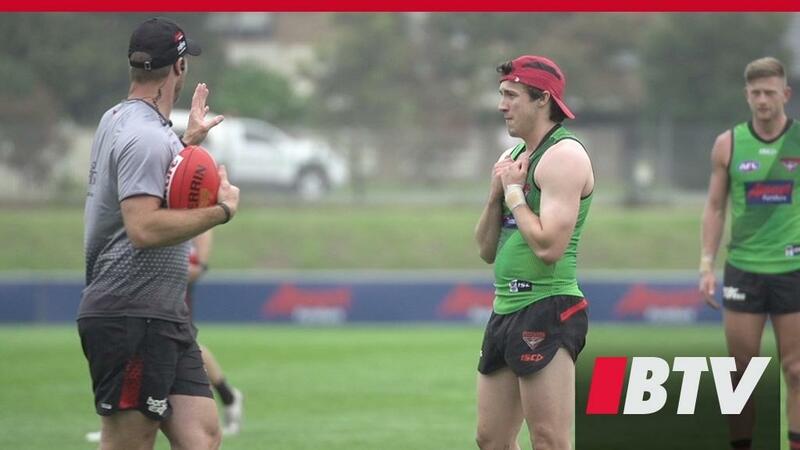 We caught up with young gun Andrew McGrath during his first week of pre-season. Yep, across the shoulders and upper chest area. Speaks well does our Andy. yep - heading into his third season and he’s getting a very decent body on himself. Playing in a team that should be on the way up would give you the confidence to enjoy your footy even more.